Chutney chutney chutney. Sometimes I just think people like the way this word rolls off the tongue here, you see it so often in the restaurants. I can tell you one thing, the French are NOT chutney purists, which is good news for me because I won't turn away anything that heightens the flavor of my meal the way that many French-styled chutneys do, even if many DO contain raisins. (Apparently raisins are some cardinal abomination never to be ever used in chutney, a rule set by the Anonymous Chutney Authority that oversees chutney's Wikipedia entry.) This Christine Ferber recipe, from her Leçons de confitures, puts raisins to excellent use. The result is simply sublime. It came together in a snap this morning and I plan to serve this tantalizing sauce at my table with my mixed pepper and spice marinated magret de canard. Note: About measures, I translated these measures from weight to volume based on the recipe which was given in gram weights. That means you can do this recipe if you don't have a kitchen scale. 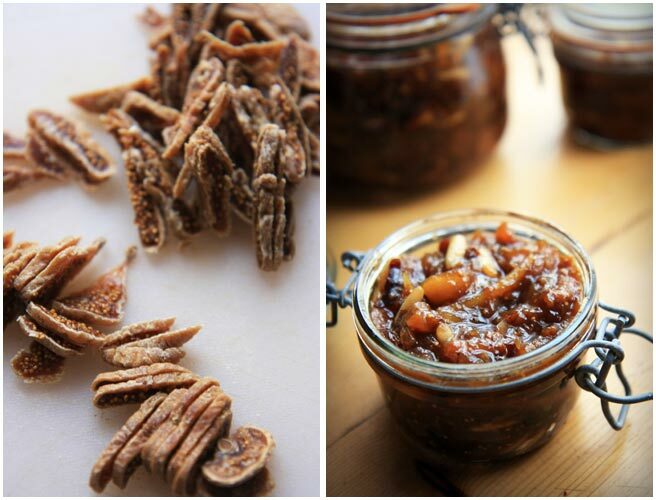 - Slice the figs, apricots and prunes into fine strips (about 2mm). - Peel, core, and finely dice the apples. - Peel and mince the onions. - Roughly chop your raisins and set them aside. - Put the figs, apricot, prunes, apples, onions, vinegar and salt in a thick bottomed stainless steel soup pot. - folding carefully with a spatula, bring the mixture to a boil. Simmer for 10 minutes, until the fruits are tender. 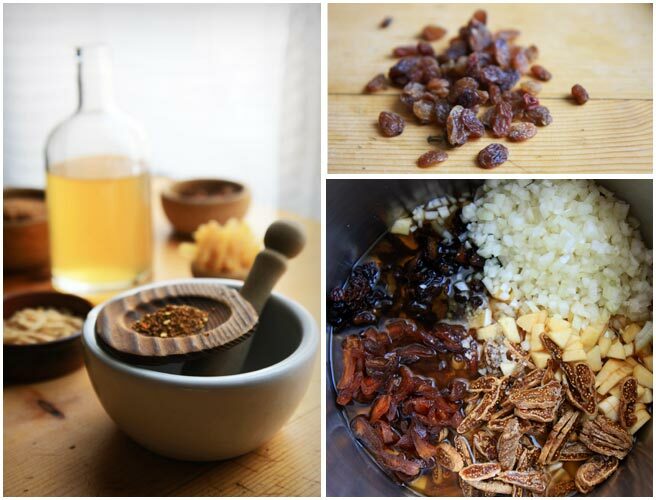 - Incorporate the sugar, honey, candied ginger and raisins. - Continue at a low simmer for about 25 minutes, folding and running the spatula along the bottom of the pan, careful not to let it caramelize or burn. The liquid will evaporate and the chutney will thicken. - Add the cayenne, the épice à pain d’épice, and the pine nuts and simmer for 10 minutes more. - Remove from heat, fill your pots, and put a lid on them. Cool to room temperature and refrigerate. Enjoy this chutney with potted or slow braised meats, potatoes cooked with goose or duck fat, game or poultry. (I guess that covers about everything). This batch makes enough for a jar to keep in your fridge for a couple of weeks, plus a jar to give to the good neighbor who left a box of apples at your doorstep. My husband is Pakistani so, though I have a deep and abiding love for les recettes de Mme Ferber, I know if I make a chutney with raisins I will never hear the end of it (particularly because he's a good cook) but I will try to sneak this recipe in somewhere. Have been catching up on your other posts and baby Ian is adorable! love that chocolate-covered face. I'm still trying to decide what flavor cake to make for my papoose's birthday next week; chocolate frosted banana cake sounds like a winner. If you leave the raisins out for your dear husband I suppose I would be none the wiser. Then again it could be the secret ingredient that pulls the whole thing together... Most of all enjoy the cake making, I loved everything about it once I'd gotten the shopping done. Your posts always brighten my day and give new inspiration for the kitchen. Thank you. Love baby Ian. Mouth watering, both the words and your beautiful pictures. How can anyone resist this chutney, especially once you mention goose?